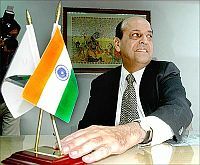 Chief Election Commissioner Navin B Chawla on Monday said making voting compulsory was not 'practical' and maintained that the legislatures will have to take a call on the issue. He also said the Election Commission will soon hold a meeting with the Union Law Secretary to discuss among other things derecognition of small parties which did not take part in the poll process for a specific period in the past. To a query from mediapersons in Madurai on making voting compulsory, Chawla said, "It is not practical." "Suppose 200 million people did not vote, is it possible to file case against each of them?," he asked. There were many people working in unorganised sector who cannot come to vote, the CEC said. He said Parliament or assemblies will have to debate such issues and enact laws. "It is the choice of Parliament. We have no machinery that would help make everybody vote," he said, adding, people will have to involve themselves in the democratic process and vote. On mushrooming of small political parties, he said, "We have written to government seeking their permission to derecognise them (such parties). It is an important issue and we will take it up with them (the government)". Describing electronic voting machines being used for polls as 'perfect,' he said there was no need for any 'technological improvement' to be made on them. "Till today, no individual could prove that the EVMs used by the EC can be tampered with," he said. On criminalisation of politics, Chawla said a 'climate' opposed to it has been created now with almost all political leaders and media speaking against the menace. "When leaders speak clearly against criminalisation of politics, it is a heartening signal. All right-minded political parties are going in the right direction," he said.